It has been nearly two months since Chrome 71 was released, and per Google's usual six-week schedule, Chrome 72 is now available on desktop and mobile platforms. This release doesn't have many user-facing changes, but there are plenty of security improvements and new features for developers. 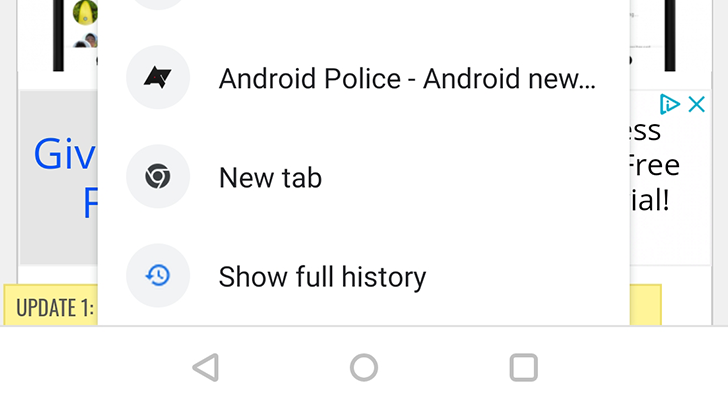 If you need to jump back a few pages, Chrome 72 has a new feature on Android that makes the process much easier. Just hold down on your device's back button, and the history of the current tab appears. Google spent over a year on Chrome's bottom address bar redesign, but it was canned at the last minute. Parts of the revamp turned into 'Chrome Duplex,' which is now called 'Chrome Duet.' Put simply, it moves Chrome's overflow menu to a bottom bar, and adds some other buttons for easy access. Duet still isn't enabled by default, but there are a few noticeable changes in Chrome 72. When the UI is enabled for the first time, a new bottom popup tells you how you can "search the web, share with friends, and see open pages" from the center magnifying glass button. Pressing the button just opens the Chrome address bar. The tab view has a few minor changes — the New Tab button has been moved to the center, and there's a new button on the bottom-right that closes all open tabs. If you want to try out the Duet UI, just search for "chrome-duet" on the chrome://flags page. As of Chrome 72, TLS 1.0 and 1.1 are deprecated. This means that warnings will appear in the browser console when visiting a site using TLS 1.0/1.1, and starting sometime next year, these sites will fail to load entirely. Firefox also plans to drop support for these versions in 2020. Google said last year that only 0.5% of HTTPS connections made by Chrome use TLS 1.0/1.1, so most people probably won't notice a change. Chrome 72 also has a few changes related to the Web Authentication API. This API allows sites to use a security key, fingerprint, or other method to log you in — instead of a password. Most major sites still don't have an option to use this API, but Chrome now allows Bluetooth U2F keys (like Google's Titan Key) and Windows Hello to serve as authentication methods. These changes are behind flags for now, but they might be enabled by default in the next release. Web pages can no longer create popups when the tab is being closed, even if you have Chrome's popup blocker turned off. Web apps can now capture "a screen or application window" using the new getDisplayMedia API. The new Intl.ListFormat API converts lists of words into the correct formatting for the user's language. For example, "['Frank', 'Christine', 'Flora', 'Harrison']" turns into "Frank, Christine, Flora, and Harrison" (if the user's language is English).